LSSO's Coaching Certification program is delivered through classroom instruction by sales and coaching experts, accompanied by in house coach es who will provide case studies and examples of the day-to-day challenges and opportunities they face and discuss the methods for meeting those challenges and leveraging opportunities. Onsite programming, a live coaching session and one class follow-on webinar will complete your certification. The Business Development and Marketing Coordinator works closely with the Business Development and Marketing Manager to support the Energy and Project Finance practices. The Coordinator is a central part of the team and is involved in a variety of projects including: entering and maintaining data in the Firm's experience management system; assisting in the creation and maintenance of business development and marketing collateral for the group, including pitches and web materials; coordinating drafts of directory submissions and client references; coordinating activities to improve the profile of the practices involving outside organizations, such as sponsorships and other major events. If you couldn't make LSSO's RainDance 2018 Conference, check out these Tweets to see what you missed. As always, the Legal Sales and Service Organization hosted a superb gathering of some of the top sales and service minds in the legal services industry on June 6-7 in Chicago, and as always, there were plenty of useful takeaways. The people at Design Build Legal are using their design-thinking experience gained from working with clients like Nordstrom to help law firms adapt to a fast-changing competitive landscape. With their help, some leading-edge firms are moving from “Here’s what we make – want to buy some?” to “What are your problems? We’ll design and deliver the solutions?” They facilitated a workshop in which audience members built models for solutions to actual problems presented by a senior legal officer at a Fortune 500 company in less than one hour – awesome. Data-masters at Intapp explained how marketing/sales professionals can help their firms to choose the right strategic direction, and get better buy-in from all key partners by focusing on key data that is available in most every firm. Loved a quote they presented by a managing partner: “If we have data [evidence] let’s use that to make decisions. But if all we have is opinions, then let’s go with mine.” Among many data “heuristics” they presented was the “Rule of 3” which says that a client is much more likely to stay and grow with a firm if that client is buying three or more types of services (litigation, corporate, real estate, etc.). They also revealed that clients who seek increasing discounts on bills are likely to jump ship soon if changes in service are not made. We learned from David Ackert of the Ackert Advisory that tracking data indicates that most prospects don’t become clients until an average of 14 impressions or touches are made (meetings, calls, content consumed, etc.). He also explained how important it is to have clear objectives for every interaction with a prospect prior to meeting or speaking with them. Thus, “winging it” is far less likely to produce a successful “impression” on which to build. Read more of my RainDance takeaways. John O. Cunningham is chair of the LSSO Editorial Board. He is a freelance writer, editor and marketing/communications consultant. Learn more here. Sales & Service Executive of the Year: Kristen Leis, Chief Marketing and Business Development Officer with Parker Poe, who spearheaded the firm’s TeamUp! Yellow Belt Certification in Legal Lean Sigma® and Project Management two-day course. The firm teamed up with clients to learn process improvement and project management skills geared specifically for the legal profession. Parker Poe was the first law firm to host this kind of course in the Carolinas. Learn more. "The course was the third installment in Parker Poe's annual initiative called The Path, which I was able to curate and lead based on direct client feedback," said Ms. Leis. "The Path series aims to deepen relationships integral to unparalleled client service. TeamUp! followed Path initiatives using gamification to 'gamify' strategic business development activities, and a mini-MBA program, which I adopted from my own Executive MBA program for all lawyers in the firm." 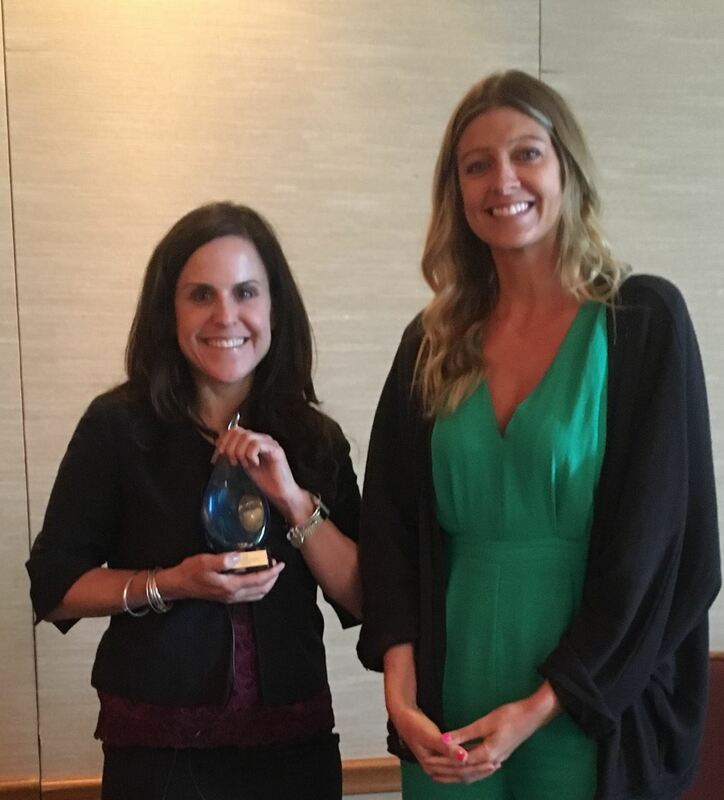 Sales & Marketing Collaboration of the Year: Orrick executed a global marketing campaign for its General Data Protection Regulation (GDPR) Readiness Assessment Tool involving collaboration between eight departments. The tool, with its engaging and innovative technology, raised the profile of Orrick’s practice and ultimately drove business to the firm. Learn more. The awards were presented by Berbay Marketing & Public Relations at the 15th Annual RainDance Conference held June 6 – 7, 2018 in Chicago at the Mid-America Club. Entries for the 2019 edition of the awards will open in November 2018. Launched in 2003, LSSO delivers the education and resources that lawyers and those who work with them need to improve their sales and client service skills with exclusive research, and tools and information for members only. LSSO supplies the legal marketplace with innovative, groundbreaking events and resources, including the annual RainDance Conference and LSSO's Process Improvement Certification Programs. Follow LSSO on Twitter and LinkedIn. Founded in 1995, Berbay Marketing & PR is a marketing and public relations firm specializing in fueling law firms’ revenue growth. Follow Berbay on Twitter, Facebook, LinkedIn and Instagram. Banner & Witcoff, Ltd. is hiring a Business Development Manager in Chicago, IL or Washington, DC. The Business Development Manager is responsible for supporting attorneys in their business development and marketing efforts, generating business leads and expanding client relationships. The Business Development Manager will collaborate with attorneys, marketing colleagues, and various departments across the firm. Banner & Witcoff, Ltd. is an intellectual property law firm with more than 110 attorneys and agents, and 98 years of practice providing legal counsel and representation to the world’s most innovative companies. Matt Nolan is Vice President of The Heico Companies, a family-owned global group of 40+ manufacturing companies spanning a number of industries. In his role as General Counsel of the Ancra Group, one of Heico's four platforms, Matt handles corporate, commercial, litigation, real estate, labor, employment, regulatory and all other legal matters for 18 companies operating on five continents. In his role as Director of Heico Compliance, Matt oversees and operates Heico's global compliance program (policies, training and process). David Cambria is the Director of Global Operations – Law, Compliance and Government Relations for Archer Daniels Midland Company (ADM) where he works with the General Counsel to develop and lead a “best-in-class” law department operations function with a primary focus on aligning the department’s day-to-day operations with the business strategy. His team is responsible for overseeing the non-legal and tactical aspects of running the department, including day to day management of the following: finance, information technology, law firm and vendor management, client service/delivers and general administration. Prior to this position, David was the Senior Director of Enterprise Information Management for CDW Corporation. There he led CDW’s Information Management program by driving information security, data management, records management, eDiscovery and intellectual property initiatives across the organization. John Cunningham will lead this fast-paced panel will be unlike any you have seen, featuring: direct one-word, one-sentence and one-minute answers to poignant questions about client concerns with legal service and sales; specific examples of sales or service techniques that have annoyed GCs or produced results; and insight into what clients value in terms of technology use, process improvement, service training, or other approaches to legal service and marketing. John Cunningham is a freelance writer and communications consultant who practiced law for nearly 17 years. During nine of those years, he served as V.P. and General Counsel to a publicly held international company and as General Counsel and Secretary to a Fortune 100 subsidiary. Stephanie Hinrichs, is the Director of Client Service at Womble Bond Dickinson. She brings more than a decade of experience in sales and marketing, specifically in the legal, economic development, airline, and transportation industries. Ss Director of Client Service, she works closely with firm attorneys and clients to initiate and expand relationships, as well as to ensure that the firm is providing the highest quality client service. Stephanie also leads the firms Manufacturing and Transport, Logistics & Infrastructure Industry Sectors. Neel Lilani serves as Managing Director at Orrick where he drives new global business opportunities through coordinated strategies across the technology sector. He leads Orrick’s global corporate development group and manages the firm’s venture capital relationships to help companies with growth financing and business strategy evolution. He has served in senior strategy roles at some of the world’s leading law firms and Fortune 500 companies and is passionate about international growth, strategic planning, and technology-driven businesses. Stephanie and Neel are leading the Role of the Sales Professional in a Client Pitch. In this workshop, you will be challenged to communicate value-add services, broader firm practice offerings outside of the core pitch focus, geographic footprint and leverage personal connections to potential client(s). David Cambria is the Director of Global Operations – Law, Compliance and Government Relations for Archer Daniels Midland Company (ADM)where he works with the General Counsel to develop and lead a “best-in-class” law department operations function with a primary focus on aligning the department’s day-to-day operations with the business strategy. His team is responsible for overseeing the non-legal and tactical aspects of running the department, including day to day management of the following: finance, information technology, law firm and vendor management, client service/delivers and general administration. Michael Caplan serves as the Goodwin's Chief Operating Officer. As COO, he manages the firm's business, financial and administrative operations. He serves on Goodwin's Executive and Management Committees, and focuses on the firm’s growth strategy and execution. His background includes roles in both corporate and consulting management positions where he has worked with over 30 general counsels in managing data analytics, technology project implementation, law firm relationship management and financial management. David and Mike will share lessons learned from running corporate legal departments and serving as the COO at an AMLaw100 firm. You will hear what they “wish they had known” and how you can apply their insight to help you create stronger partnerships between your law firm and corporate legal departments.